Most would agree that life changed for the three owners of Kern River Brewing Company (KRBC) when they won the gold medal for their Citra Double IPA at the Great American Beer Festival (GABF) in Denver Colorado on October 1, 2011. 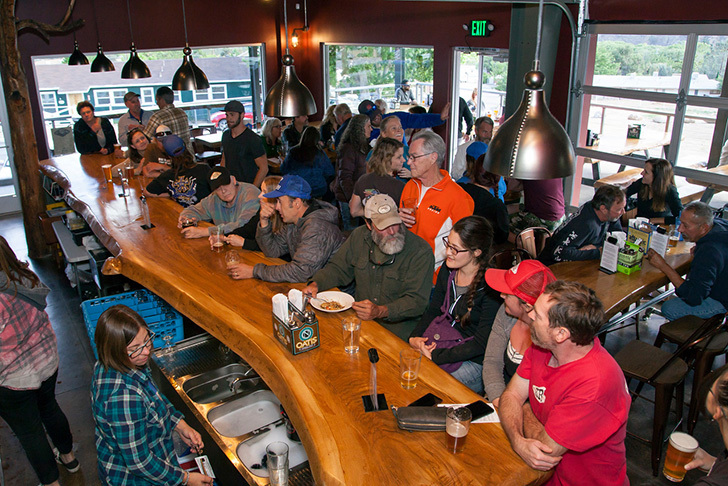 As someone who started as a home brewer at his Kernville home a good 10 years before KRBC opened in 2006, brew master Kyle Smith was particularly thrilled to shake Charlie Papazian's hand when he received the award. "It felt great to get the gold," Smith said. 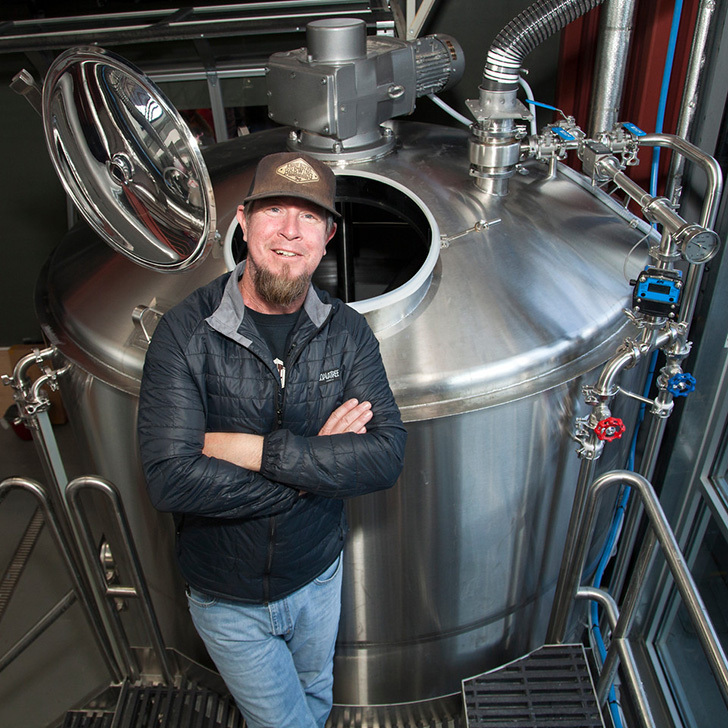 "It's an honor to win at that festival because it's the largest beer festival in the world. It was pretty awesome,” he added. Smith, along with co-owners Eric and Rebecca Giddens with their baby daughter Maggie, were on hand to receive the award from Papazian, President of the Brewers Association and legend in the brewing world. The Imperial IPA category is among the most competitive at the annual beer festival, with more than 100 entries received in 2011. Homebrewers and professional brewers alike looking to increase their medal wins know very well to stay away from this category as it's insanely over represented given the high interest in the beer style. Chances of winning are considerably lower than other categories. GABF is the largest commercial beer competition in the world, and had 3,930 beers vying for medals that year alone. "The Imperial IPA category was one of the five toughest categories in the festival in terms of the number of entries; it is certainly one of the more coveted awards of the entire festival,” said Eric Giddens in a public announcement about the award. "Needless to say we are extremely excited about the award and proud of Kyle for this amazing achievement." 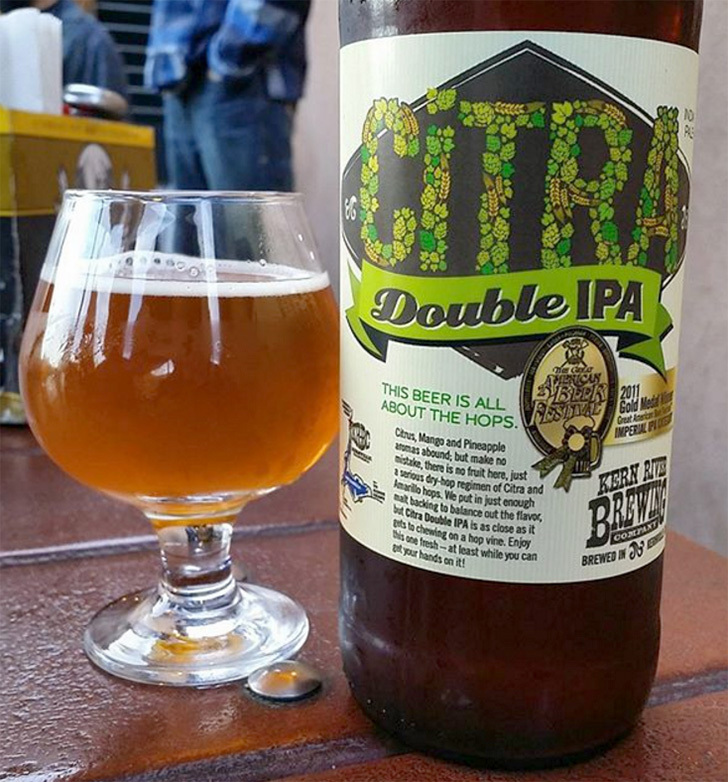 KRBC's Citra Double IPA is one of the few beers that scores a perfect 100 on both Beeradvocate and Ratebeer. Keep reading and we'll show you how to brew it yourself, using a recipe and instructions that brew master Kyle Smith himself was gracious enough to make available. From its beginnings, Kernville has been a wild-west town. It is a small town of less than 2000 located 42 miles northeast of Bakersfield California in the southern end of the Sierra Nevada mountains. Established as a mining settlement in the mid 1800's and continuing as a ranching community through the 1900's, Kernville remains a town of adventure, offering a wide variety of outdoor activities including whitewater rafting, skiing, fishing, camping, mountain biking, and climbing. 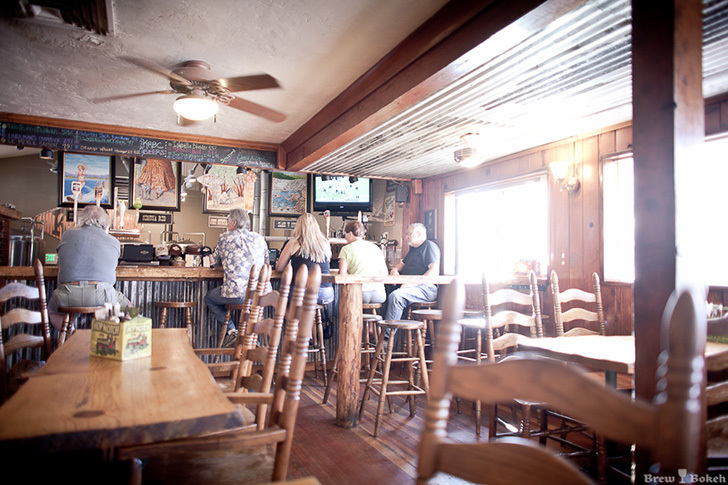 According to the Kernville Chamber, on any given weekend the town of Kernville can easily swell to between 20-40 thousand people, all of whom are looking for entertainment. 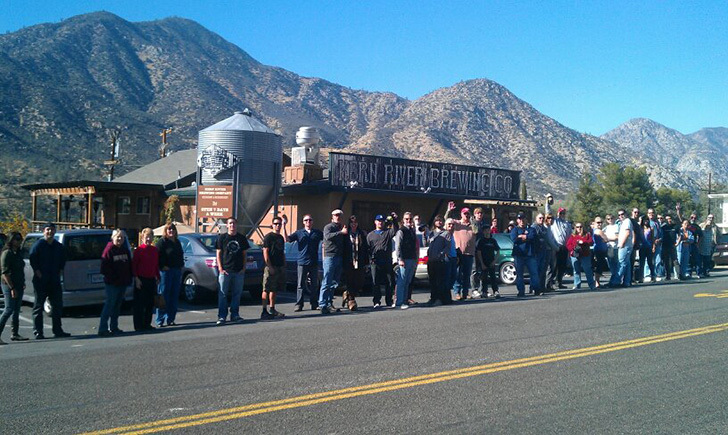 This helped put Kern River Brewing Company on the map as Kernville's first brewpub. 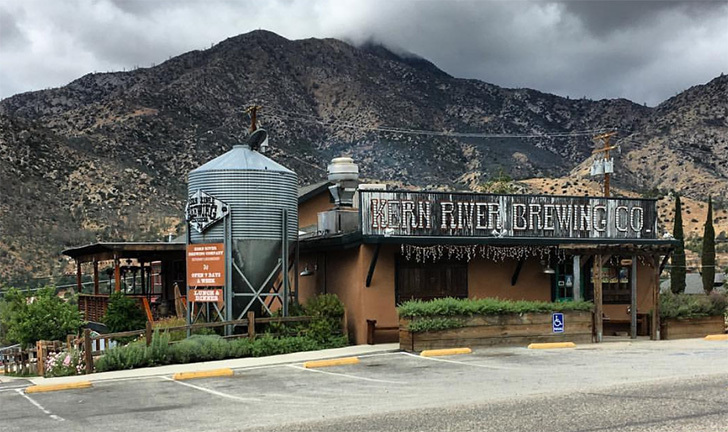 Located just a few blocks from the tumultuous Kern River at 13415 Sierra Highway, KRBC serves up some of the best beers and pub grub in the Southern Sierras. They offer different beers to suit each season of the year, thus adding variety to the year-round offerings of Isabella Blonde, Sequoia Red, Class V Stout, and Just Outstanding IPA. During the heat of summer, you can stop in for one of their house-made root beer floats (or with their Class V Stout if you prefer) followed by a sampling of appetizers, burgers and brats. Be sure to stock up on a growler or two before heading back to camp! 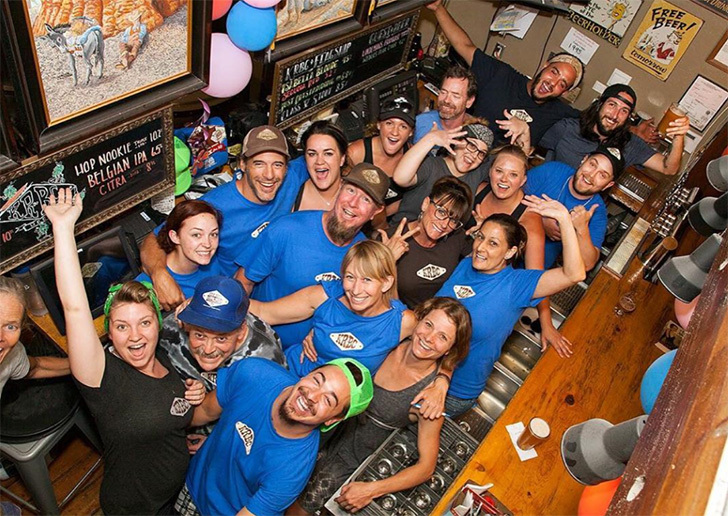 Keeping the names of the beer local, providing a simple yet diverse menu and having a comfortable place where "everybody knows your name", Kern River Valley residents and visitors alike have helped made KRBC a success. 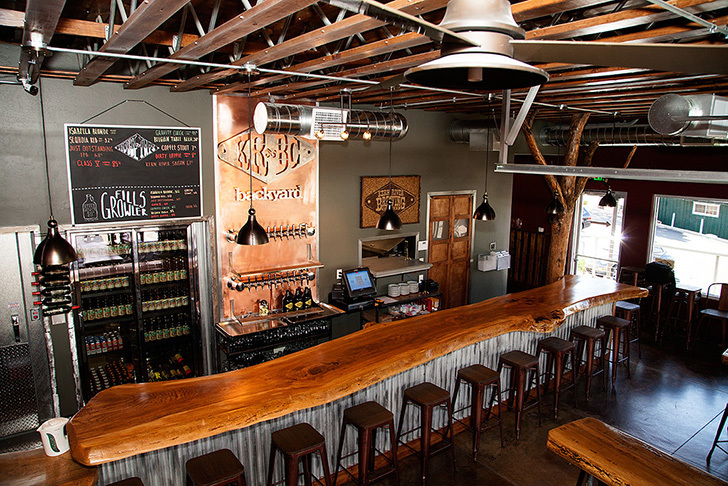 Most likely due to this success, in May 2016 (almost exactly 10 years after opening) KRBC opened their new (larger) facility called the "backyard" that is directly behind the original pub. 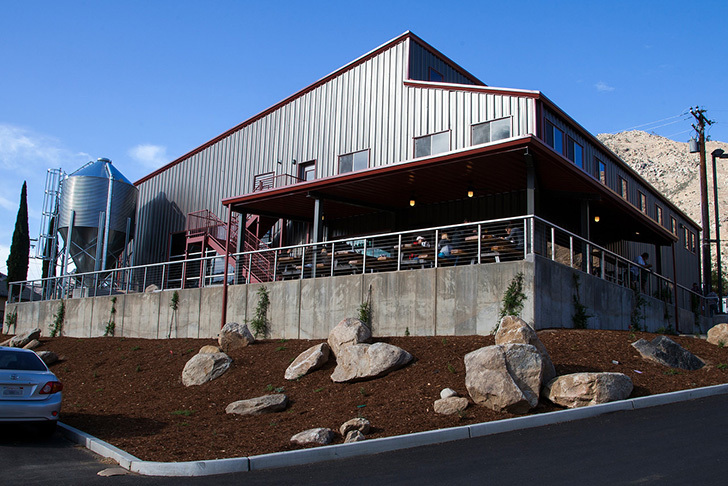 Beer at this location is brewed mostly for distribution and during the summer months they have a food menu and patio for patrons to hang out in and enjoy. 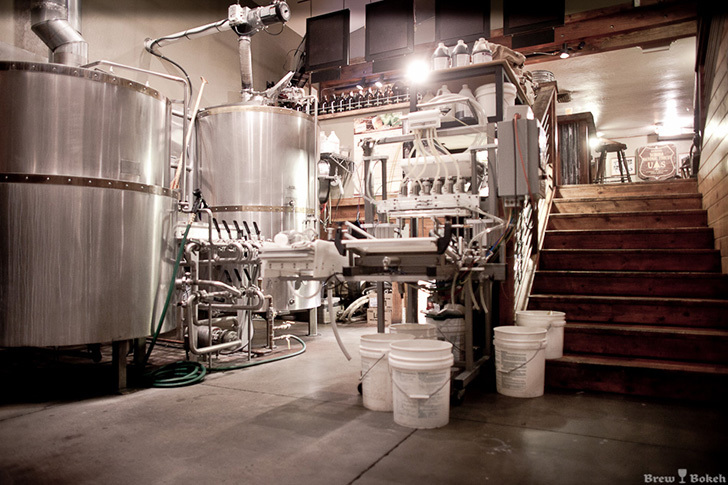 We're told that the original pub will stay as it is and be used for small batches and experimental beers. Citra Double IPA, one of KRBC's seasonal beers, has definitely become a customer favourite since it won in 2011. It's a double IPA that is hazy pale in color with a strong pungent aroma that comes from large amounts of Citra hops sourced from Yakima Valley in Washington. The double IPA includes massive citrus and tropical/fruit notes with some background resin and citrus peel as well. Dankness is somewhat subdued and the beer is not overly bitter (for a double IPA). This beer is often referred to one that is "liked by many that don't like IPAs, and loved by those that do." 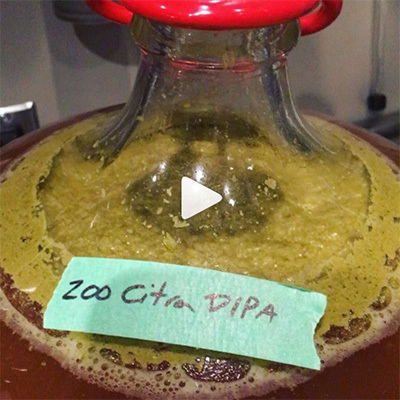 "This beer is all about the hops. Citrus, Mango and Pineapple aromas abound; but make no mistake, there is no fruit here, just a serious dry-hop regimen of Citra and Amarillo hops. We put in just enough malt backing to balance out the flavor, but Citra Double IPA is as close as it gets to chewing on a hop vine. Enjoy this one fresh - at least while you can get your hands on it!" The alcohol content is 8%, so be careful as the smoothness makes this double IPA almost as quaffable as a regular 5% beer. Six months after the GABF win, Kyle Smith (the brew master) joined Jamil Zainasheff's "Can You Brew It" podcast to discuss the beer in detail including the recipe and process used. The intent of this series of shows is to see if a commercial beer can be replicated. Tasty McDole (brewer behind the popular beer Janet's Brown Ale) attempted to clone the beer using the information provided and the result was a deemed a success by everyone who tasted both versions. The two were considered the same. The recipe and instructions here are the result of scaling down the recipe and process as described by Kyle to a 10 gallon batch for brewing on my setup. For the most part this recipe exactly follows the original except for one change: Like Tasty, I moved the 30 minute hop addition to 0, with a 20 minute whirlpool (which for me gives similar bittering results but with better flavour/aroma). The interviewers really know their stuff and always asked the right questions to really nail down the entire process from grain to glass. Well done! A truly fantastic beer by Kern River Brewing Company. Passing through the Kernville California area? Stop in at KRBC and show your appreciation by picking up a growler or two. By supporting open minded brewer masters like Kyle and their breweries, we'll continue to see others willing to share their knowledge and passion about brewing, keeping it a win/win for all involved. 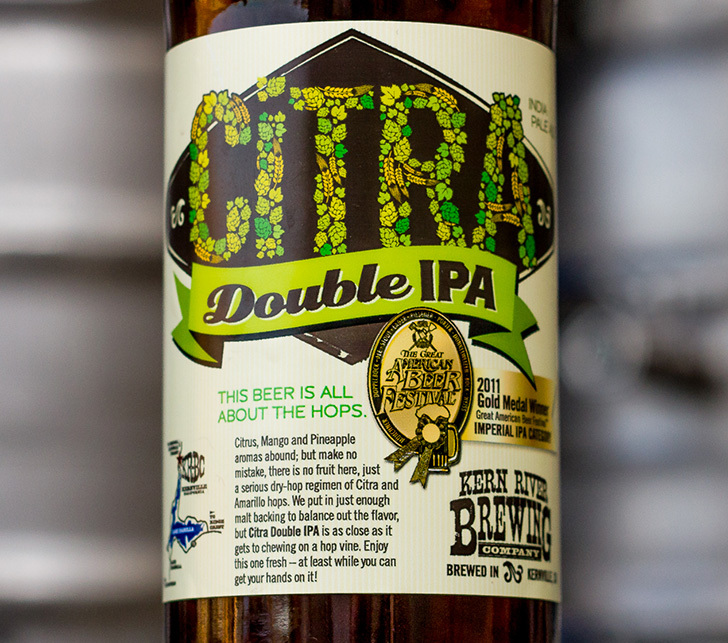 Brew up a batch of Citra Double IPA and let us know how you like it! Mash at 148F for 120 mins. Boil for 60 minutes. After boil steep/whirlpool for 20 minutes with the lid on. (I simply take the lid off and gently stir every few minutes). After the whirlpool chill wort to 67F and aerate extremely well. Pure oxygen from a tank can help at a rate of 1 litre per minute for 120 seconds. Ferment at 67F until complete plus an extra 2-3 days. Rack to CO2 purged brite tank. Add dry hop #1. This day 1. (Gently swirl 2-3 times/day). After 3 days (day 3) add dry hop #2. Leave previous hops in. (Gently swirl 2-3 times/day). After 3 days (day 6) add dry hop #3. Leave previous hops in. (Gently swirl 2-3 times/day). After 3 days (day 9) add dry hop #4. Leave previous hops in. (Gently swirl 2-3 times/day). After 3 days (day 12) rack to CO2 purged keg(s). Do not use finings. Carbonate on the low side (around 2 to 2.2 volumes of C02) to minimize carbonic bite and let the hop/malt flavour come through. Once fermentation has completed, in order to prevent oxidation and maximize the hop flavours and aromas, it's very important to minimize oxygen contact with the beer. This means that when racking to a new vessel, always purge the vessel first with CO2. As well, whenever opening a vessel to add dry hops, always make sure to fill the head space with a squirt of CO2. You're going to be opening/closing the vessel(s) multiple times so minimizing oxidation is critical. "Boil for 60 minutes. Lid on at flameout, start chilling immediately." Should this be updated to include the 20 minute whirlpool? 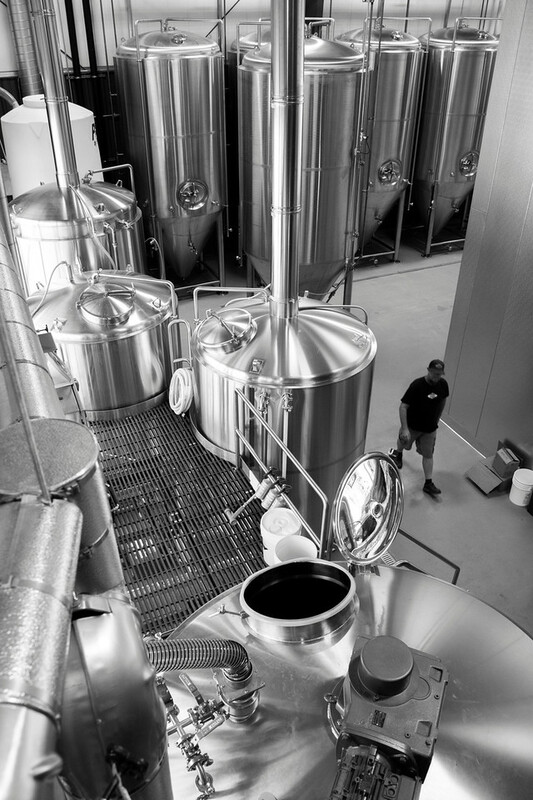 have you ever compared dry hopping in the primary vs dry hopping in a second vessel? Good catch! Thanks for noticing. I've now updated it. I've done both many times in different ways. Often when multiple hop additions are required I'll do the first round at the end or near the end of fermentation in the primary vessel and then rack off into the secondary once fermentation is done and continue with more dry hopping. I've also done it in the keg. I've never however done a split batch where one is dry hopped in the primary and the other in the secondary to see what differences there would be so it's hard to compare the different practices as all beers are different. If you try a split batch using the two methods please report back and let us know what you think. If you read up on it brewers will say it's indeed different dry hopping on yeast in the primary near the end of fermentation vs off most of the yeast in the secondary (or brite tank). Not better or worse, just different. I've heard some brewers say they prefer the taste when done in the primary. Probably depends on the hops, the beer, and the brewer's preference. Some will say that the yeast tends to eat up or absorb some of the hop oils so you need to add more hops to compensate. I quite often do dry hop in the primary as I like the results and it's much easier to rack/clean as I usually use plastic buckets for the primary. Right now I have an Electric Pale Ale (4.3% version) fermenting at ~64-66F. Usually after about a week I'll add the dry hops directly to the buckets after fermentation is pretty much done and then leave it for another week so that it's definitely done. Then rack to glass 5 gallon carboys (my brite tanks), add gelatin, wait ~2 days, and then keg. 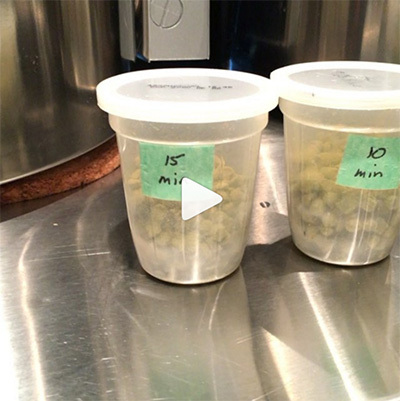 If you listen to the podcast you'll hear how the Kyle of Kern River dry hops under pressure. What that means is that they do not let any CO2 escape while fermentation finishes and they dry hop - the vessel's sealed tight. The idea is that you're not venting any CO2 out that contains those hop oils. You have to release the pressure each time you go to add new dry hops but I suppose the idea is that during those ~3 days in between the oils infused CO2 has time to get re-absorbed into the beer somewhat. Tasty (who cloned the beer) didn't do this and they said the results were not any different (the beers tasted the same). This is good because dry hopping under pressure is not something most homebrewers can do. You need a stainless vessel and you have to absolutely be sure to have a pressure relief valve on it that blows if the pressure gets too high (for safety reasons). Why the 8 lbs less grain than the original recipe posted on the BN? It likely has to do with differences in mash efficiency. Mine's 95%. They probably assume around 70-75% which is about average. Grain amounts for all recipes always need to be adjusted to compensate for what your system's mash efficiency is compared to what the recipe author assumes. The two are rarely ever the same. (1) All systems have different efficiencies so different amounts are always needed anyway. (2) Percentages are batch size independent (doesn't matter if you're brewing 5 gallons or 500 gallons). (3) Percentages are are much easier to understand for an experienced brewer. Seeing something like (for example) what % of the grist is unfermentable malt gives you a good idea what the beer's going to be like. If only amounts are given you have to do the math to calculate how much crystal there is (for example). Whenever someone asks me "how does this recipe look" I have to always convert to percentages for it to make any sense. When I first started putting recipes online here I toyed with the idea of trying to "make things right" and only post percentages for the grist but chose not to as an inexperienced brewer brewing on my exact design may find it easier to simply use the exact amounts (at least at first). How did the beer turned out? Absolutely fantastic! For what it's worth, I only post recipes that I deem 'perfect'. So if you see a beer listed here by me, it's one that may have been brewed a few times already in order to tweak it to perfection. Your recipes and the background information going with them are always awesome, thanks! I brewed you German Pils a couple of months back and it is my favourite beer I have brewed so far. I am working on a recipe for an IPA (American IPA) and found the use of 2.5% White wheat malt in this recipe interesting. What would be the benefit of using the white wheat malt, what would happen if you leave it out or increase it to a more significant level? Thanks for the kind words and glad to hear you're enjoying the recipes Bennet! At lower percentages (5 to 20 percent) of the grist, wheat malt can be added to any number of beer styles to enhance the head retention without clarity problems. You'll often see it in the low single digits to aid in head retention and body as was likely done here. To quote Malting and Brewing Science, the classic brewing text: "The use of wheat malt at up to 20 percent of the total grist has been claimed to strengthen the yeast, and improve the clarity and head retention of the beer." Wheat malt is also of course traditional used in beers like Weizens and Witbier where it makes up 40-60% of the grain bill. You're welcome! Enjoy the recipe if you get a chance to brew it! It's a very straightforward brew and the results are fantastic (IMHO). Quick question Kal (or anyone who's brewed this): I haven't done many dry hopped beers. I have a couple conical fermentors and I'd like to avoid racking to a bright tank to minimize any chance of oxygenation (that..and isn't this one of the benefits of a conical?). Would you recommend a trub dump one primary fermentation is done and before I start dry hopping? As well, once the bulk of fermentation is done at 67, would you forsee any issue letting the temps climb up to ambient (74 degrees right now)? Sure - if using conicals you can drop the trub and then try hop. Same result. For what it's worth, oxygenation isn't an issue with racking if you always purge the target vessel with CO2 (something I always whenever racking, regardless of beer style). Nope. 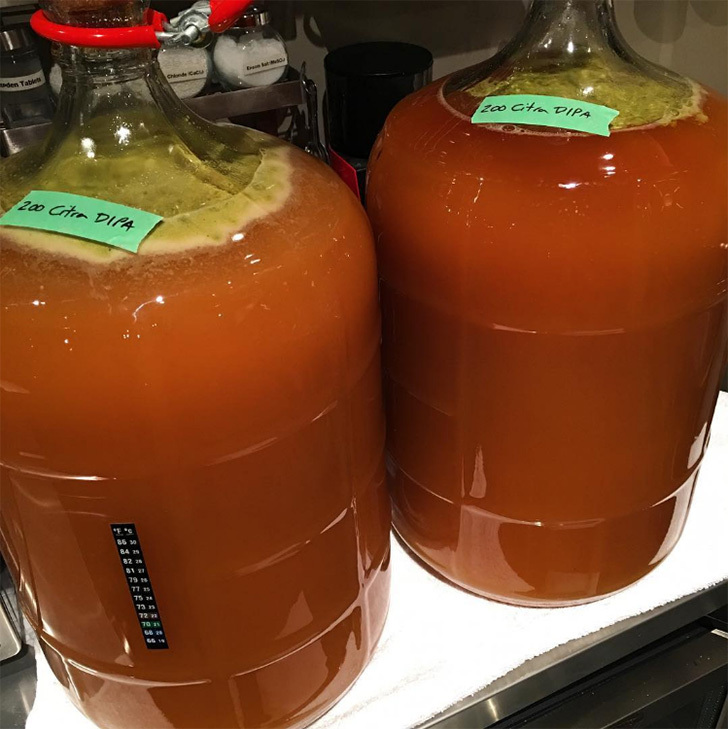 Once the bulk of fermentation is done, raising a bit would not be an issue. In fact, it can help with attenuation if you tend to have problems. Thanks Kal - I actually bought a couple of plastic 5 gal PET carboys I plan to eventually use as brite tanks to free up the conicals. But trying to drag those suckers in and out of a keezer to cold crash is a challenge...can't wait to start investing a bit more into larger dedicated fridge after an upcoming move. That's interesting you should say that plastic vessels may permeate oxygen Kal, but I wonder if there is any empirical evidence to back this up? I often bulk-age beer in purpose-made plastic fermenting barrels from Brouwland (www.brouwland.com), sometimes for 6 months with an imperial stout, and have never had problems. Even if the stored beer has stopped fermenting, I wonder if the higher density of what's in the vessel compared to free air would actually prevent oxygen getting in. That's interesting you should say that plastic vessels may permeate oxygen Kal, but I wonder if there is any empirical evidence to back this up? Sure - probably thousands. It's a well known phenomenon and I imagine a lot of studies have been done in the food/beverage packaging industry to weigh pros and cons of using more expensive packaging (ie: glass) as compared to cheaper ones (ie: plastic). Googling "plastic permeability" comes up with a bunch. What you store, how, and in what sort of plastic will have varying results of course. Permeability is known to occur, what exactly the effects are based on what you're storing, for how long, in what conditions (pressure/temp/etc) are the really important questions I suppose. Sometimes oxygen pickup is good too. Think of aging in barrels. They're actually meant to breath. In some cases you may want more oxygen permeability. In some cases you'd actually want to store your wine in something that breaths more. Sometimes you don't. In their case their Flextanks sit right between old and new barrels because with wine aging you usually want some breathing. I could see wanting some breathing with beers like a RIS or a Barleywine you want to age for a long time. For others (such as this hop forward beer) I would say you don't. Oxygen destroys hop flavour/aroma/freshness. I only bring it up as something to consider/possibly look in to/make sure you're aware.